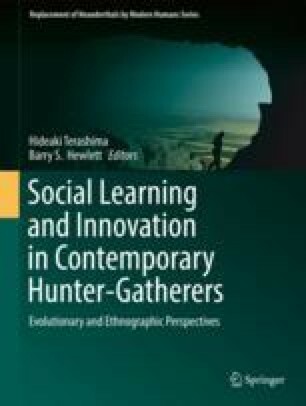 Based upon an earlier study of innovation and the transmission and acquisition of innovative skills and knowledge among Aka forager adolescents of central Africa, this study examines the same topic among Chabu adolescents of southwestern Ethiopia, a forager-farming society. Research with the Aka foragers questioned several evolutionary predictions about who should innovate and how innovations should be transmitted (i.e., adolescents, males in particular, should be more innovative than children and adults, innovations should spread by horizontal transmission, and adolescents should pay particular attention to prestigious, “successful” peers). In-depth and structured interviews, informal observations, and systematic ranking and sorting techniques with 14 Chabu adolescents and seven adults were utilized in this study. Major results in terms of the processes and modes of social learning suggest that: (1) oblique modes of transmission were exhibited with greater frequency than horizontal, while prestige bias was indirectly important and linked to reproductive efforts and (2) direct teaching was very important but not exclusively utilized as a means of transmitting social knowledge and reflective of the complexity of skills being taught. Additional results indicate that as with the Aka data, (3) cultural terms specific to innovation existed, (4) innovations and innovators were easily identified by adolescents, (5) innovators were actively sought out individuals who exhibited pro-social qualities and were “good teachers,” and (6) adults were more often identified by the adolescents to be innovators. One result was inconsistent with the Aka study: Chabu adult females were more likely to be identified as innovators than were adult males. As the Chabu women produce highly valued and desired pottery with innovative designs, which sell well at the local market, these data suggest that innovative gender bias is domain dependent.